We all want to live a life that matters. We all want to reach our full potential. But too often we find ourselves overwhelmed by the day-to-day. Our big goals get pushed to the back burner--and then, more often than not, they get forgotten. New York Times bestselling author Michael Hyatt wants readers to know that it doesn't have to be this way. In fact, he thinks that this is the year readers can finally close the gap between reality and their dreams. 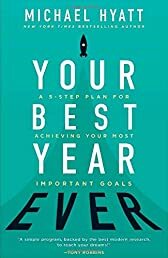 Anyone who is tired of not seeing progress in their personal, intellectual, business, relationship, or financial goals will treasure the field-tested wisdom found in these pages. You Need a Budget: The Proven System for Breaking the Paycheck-to-Paycheck Cycle, Getting Out of Debt,..